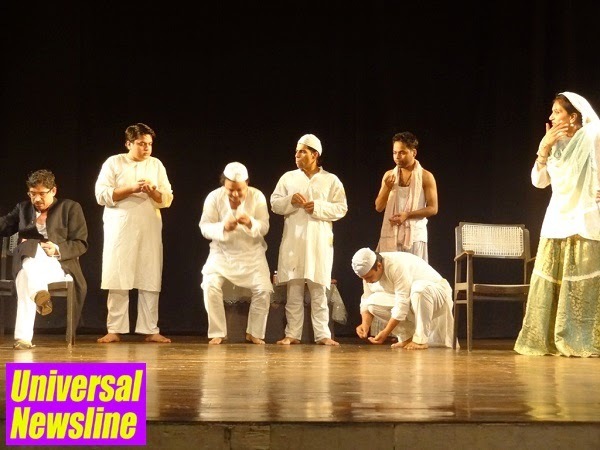 New Delhi, Oct 18, 2014: The six-day Urdu Drama Festival that paid a warm tribute to legendary writers Khwaja Ahmed Abbas and Qudsia Zaidi ended today with the staging of the latter’s humorous take on ordinary life -- ‘Dhoban Ko Kapde Diye’. The play, penned by renowned playwright Begum Zaidi, was extracted from her famous Chacha Chakkan series. The play centers around Chacha Chakkan, a 45 year old gentleman and his family and his quirky misadventures due to his penchant for interfering in house-hold affairs, much to the consternation of his wife. The play captures the little details of quotidian life of an ordinary family and depicts the socio-cultural milieu of our country in 1950s in a light, humorous way. Presented by the Social Pride Welfare Society, the play was directed by Danish Iqbal, a prominent name in the current crops of theater persons in the country. The festival was presented by Delhi Government’s Department of Art, Culture & Languages in association with the Urdu Academy and paid deep tributes to Khwaja Ahmed Abbas and Qudsia Zaidi. Over six days, the plays written by the two writers were staged as part of the festival. The tribute came as part of the centenary year celebrations of the two legends, both of whom were born in a pre-independence India in 1914. While the former went on to become a leading journalist and an eminent script writer in the Bollywood of Nehruvian years, the latter is renowned for her pioneering role in establishing the Hindustani Theatre in Delhi. “We are happy that the festival played its part in reviving consciousness among the people about these two leading figures in the field of Indian art and culture. Khwaja Ahmed Abbas was a towering figure in India’s literary circuit and in some ways he lead the avant garde cinema in Bollywood during the 1970s when he penned films like Neecha Nagar, Jagte Raho and Saat Hindustani. His writings symbolized the spirit of Nehruvian socialism and gave a voice to a young India’s quest for social justice and equality. During the same years, Qudsia Zaidi led a very different movement by laying the roots of Indian theatre. It is a matter of pride for us that we are paying tribute to these two legends through this festival,” says Anis Azmi, Secretary, Urdu Academy.